Which is of course a joke my mother will recognize – at any Chinese restaurant the only things my kids would eat was chicken with broccoli. It did not look like this. 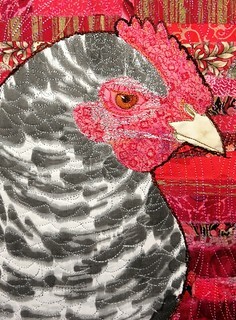 Alice suggested a line of stitching to set of the chicken from her background, and I love the way it looks now. The broccoli all standing on the trays at the supermarket made me think of a forest, and contemplate for a moment what it would be like to be that small. I am still working on the next chicken, a gold laced Wyandotte. wonderful, grumpy, ferocious chicken. Well done Cynth! 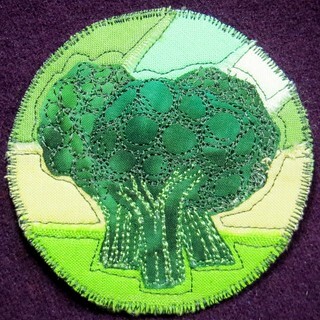 And a beautiful broccoli forest. I am in awe of your talent and determination. Hi, Lee, I’m just wondering if that chicken is for sale. It kinda looks like my friend Clair’s “Peckatina” and I would love to buy it for her. I read your blog faithfully, and often think about commenting, but….ya know….WOW, it blew my mind that Aerin is off to the university! Just…WOW. How is she doing?